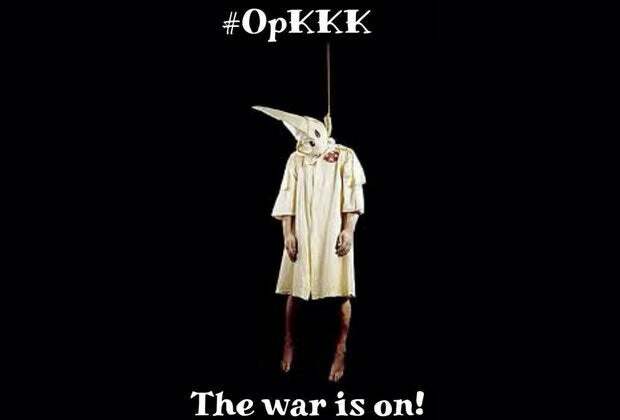 Operation KKK leaks: Will Anonymous yank KKK hoods off of politicians, cops, feds? Anonymous has promised to make this Fifth of November memorable by leaking the personal details of alleged KKK members -- some of whom are supposedly cops, feds, mayors, senators and even a pastor. Buckle up for #OpKKK and #Hoodsoff cyber-fireworks as lists are already being leaked and Anonymous claims it will expose up to 1,000 alleged KKK members. Just as it is unlikely that anyone in Lahoma will forget the KKK costume-torch-cross incident anytime soon, some Anonymous hacktivists have not forgotten when the Ku Klux Klan threatened to use “lethal force” against peaceful Ferguson protesters a year ago. Anonymous targeted the KKK with #OpKKK and #HoodsOff last year and the countdown clock is moving ever closer to a repeat #OpKKK and #HoodsOff performance. “Remember, remember! The Fifth of November,” begins a verse from the movie V for Vendetta. Nov. 5 is when some revelers celebrate Guy Fawkes Night – and Guy Fawkes masks have become a symbol for the “face” of Anonymous. This November 5, Anonymous will dump “more than 1,000” KKK members’ names and websites. The first batch of doxing – of bringing “transparency” to the KKK and stripping the anonymity of hooded KKK members – has begun. Last year, the KKK distributed flyers that threatened to use lethal force against Ferguson “terrorists masquerading as ‘peaceful protesters.’” After that snagged the attention of Anonymous, the KKK later threatened to shoot anyone wearing a Guy Fawkes mask. But this year it is the IntelGroup under the Anonymous banner calling the KKK “terrorists” and promising to strip KKK members of their anonymity. The first batch of doxing came in the form of three dumps on Pastebin; the leaked lists include a personal website, over 40 phone numbers and a couple dozen email addresses belonging to alleged KKK members. A new dump of 13 phone numbers were leaked today via Pastebin; there is also an ongoing tweeted doxing campaign, thus far naming a pastor, a senator and cops who are allegedly members of the Ku Klux Klan. “We never forgot your threats to the protesters in Ferguson, and we certainly never forgave you,” read the second press release by Anonymous. “More than four hundred years ago a great citizen wished to embed the Fifth of November forever in our memory. His hope was to remind the world that fairness, justice, and freedom are more than words, they are perspectives.” It goes on to call kindred spirits to stand together and give the KKK a Fifth of November that “shall never, ever” be forgotten. Meanwhile, a hacker going by the Twitter name of “Amped Attacks” has launched his own attacks on hate groups, taking down KKK websites and the official website for Westboro Baptist Church. Amped Attacks, who claims to be working on his own – to not be involved with any hacktivists groups – said he hacked into KKK websites, discovered a number of political figures allegedly involved with KKK, and used Pastebin to dump a list of senators and mayors who are supposedly KKK members. Although unconfirmed, there are already some tweeters calling for the senators and mayors to resign.